My warm greetings to all of you members that have gathered here from around the world to commemorate this time today. I came here today with a fluttering heart—with the heart a parent experiences when visiting a daughter after sending her off to marriage fifty years earlier, the heart felt when visiting a son that had left home. Heaven’s providential history was one of sadness and suffering. In the beginning, God began his creation and created the first human beings to realize his great dream. He also bestowed responsibility on the first humans. Yet, they went off track and could not be achieve God’s great dream. The beginning and end of our almighty God are the same. Hence, he cannot leave a failure alone. For this reason, Heaven worked for the long period of six thousand years as expressed in the Bible to enlighten people. How sad and excruciating was that course? It took four thousand years to find and establish a people within the fallen world. Why was it so hard? That was because they were unaware of the fact that all mistakes must be indemnified. God sent the Messiah through the Israelites. Many religions have existed, but only Jesus explained the relationship between Heaven and human beings to be that of father and child. He said he was God’s only begotten son, born with no ties to the fallen world. A miracle-like providence would have unfolded in front of fallen humanity; yet, what happened? He was crucified. He died on the cross. After this, the Christian providential history took two thousand years. Though there are many Christians, they are unaware of God’s providence. Christianity, which began through the descent of the Holy Spirit in Mark’s upper room, unfolded for two thousand years. Whenever I visit Europe, my heart is always heavy. Christianity and Christian culture bloomed centered on Europe. Though it faced many difficulties, it is through Europe that Christianity expanded its foundation; however, what has happened? I will use an example from the Bible. The people within the fallen world are described as wild olive trees and these wild olive trees desire to become cultivated olive trees. An interesting point is that for the tree to function normally, it must grow roots for the long period of fifteen years. When you go to Israel or elsewhere in the Middle East, you will find many olive trees that are older than two thousand years. The Middle East is a barren land. Hence, it takes fifteen years for an olive tree to endure the climate and deeply sink its roots. Please contemplate this. Providential history does not stop. It does not wait for the right time either. It keeps moving ahead. That is why it took the long period of six thousand years. We have passed the Old Testament Age and the New Testament Age. What age are we living in today? We are living in the Completed Testament Age, in which we attend True Parents and live their teachings. What is happening to the Completed Testament Age? It is developing into Cheon Il Guk. We must reveal the truth. For the wild olive trees in the fallen world to become cultivated olive trees, they must meet the true owners. The true owners are none other than our True Parents. You must change your bloodline through True Parents. You must be newly born and resurrected. In other words, you must receive the blessing. That is why you must achieve blessed families, true families. When we observe European culture, there are many stories similar to those of the Unification Church. Christian culture, which began empty-handed, has led the past two-thousand years. What did Jesus say he would do upon his advent? He said he would hold the marriage supper of the Lamb. In other words, it meant that he would emerge as the True Parents to save fallen humanity. Unfortunately, Christian culture still dwells within the New Testament Age. We are quite ahead of them. The history of missionary work in Europe is now fifty years. If we compare that to one lifetime, we have lived more than half our life. Now what are we to do? You were able to grow deep roots in this land during the past fifty years. No force can get rid of you anymore. The roots you have grown will remain strong until the day you achieve the hope of Heaven and of humankind. Blessed families! Why did we gather here today? We must get away from a monotonous life, in which tomorrow is the same as yesterday. We must reveal the truth. You must awaken European Christians, who are unaware that the returning Messiah, who is to come amidst the Christian cultural sphere, has emerged as the True Parents and that for fifty years they have accomplished amazing things. As of today, a new cultural revolution will appear on this continent. I sincerely hope that you become proud Unification Church blessed families that fulfill their responsibilities and hasten the day that all people become one family that attends our Heavenly Parent and True Parents. Do you agree? It took two thousand years for the Christian culture, which arose centered on Europe, to establish its foundation on the global level. As we reflect again on the past fifty years, how should the Unification Church civilization move in this era after the coming of Heaven? Are you confident? Please remember that you must continue to grow roots that are big and wide and go deep until you breathe your last. Now that we do not have much time left until 2020, I came with the heart that I will graft the Christian cultural sphere—which has endured the past two thousand years with a heart desperate to meet the returning Messiah as their last ray of hope—to True Parents’ true love. I am establishing Cheonji Seonhak Won for this purpose. What then should you all do? 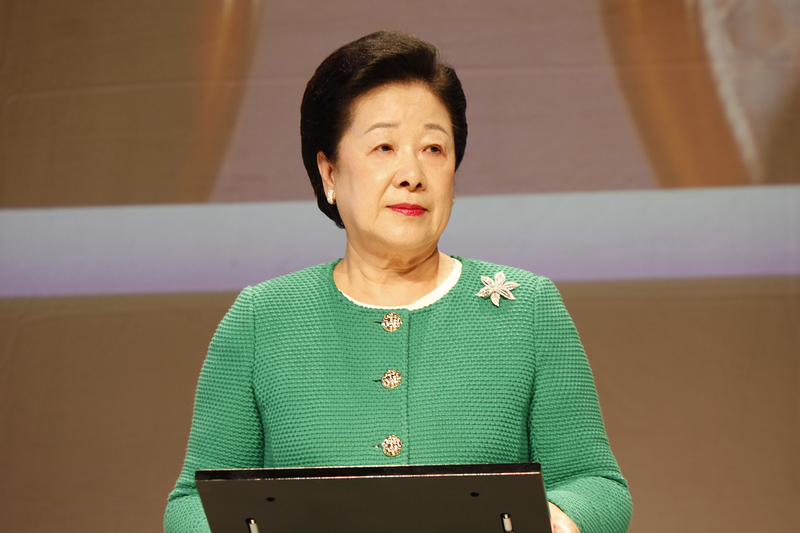 You must reveal to all people of the world, who are living amidst ignorance and clinging to the past, that blessed families of the Unification Church are beacons and can bear the fruit of hope for the future.